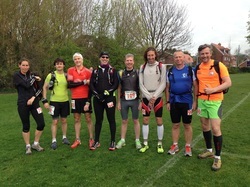 On Saturday 5th April 2014 6 brt members ran the South Downs Way 50 mile Ultra. Susie Casebourne, Tim Cox, Dave Palmer, Colin Hanks, Danny Garbett & Alan Bennett. Some were attempting to better their results from last time, others using the experience as a training run for bigger goals later in the year, or for some it was about the journey & to just finish their 1st Ultra event. It cannot be stressed enough how tough both mentally & physically this type of event is. To be on the start line having completed all the training without incurring injuries is an achievement in itself. Pleased to report all 6 finished in great times & the weather was a vast improvement on the wet & freezing conditions of last year. The runners would like to thank all their families, friends & supporters. And so, with the dust from the SDW50 barely settled, we move on to planning for the SDW100 on June 14th/15th. Much work to do, but if it were easy then I wouldn't see the point. Massive thank you to EVERYONES amazing support. Did the winner get a cheer as big as us? & finally - Inspired, then get in touch with any of these & realise your dreams!